MANILA, Feb. 05, 2018 – Fans of the Fifty Shades book and film series are in for a special treat as Universal Pictures' Fifty Shades Freed, the climactic chapter based on the worldwide bestselling phenomenon, has been approved without cuts by the Movie & Television Review & Classification Board (MTRCB). The MTRCB gave the film's original US version an R-18 Rating, which means only persons aged 18-years old and above may be admitted. 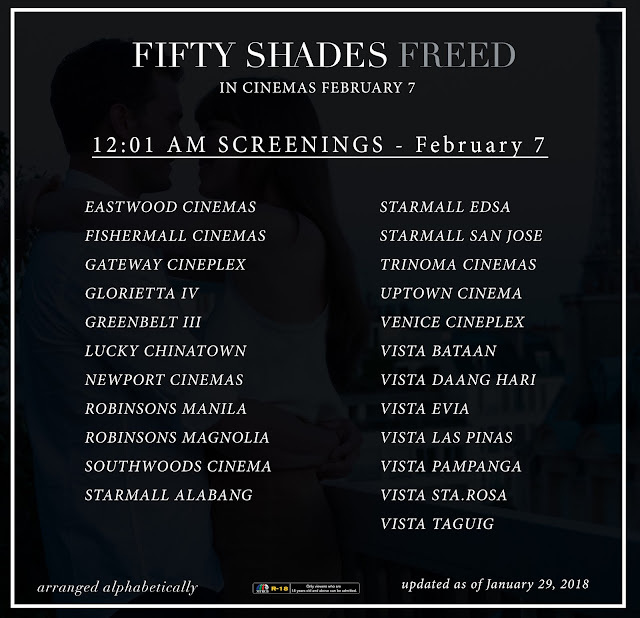 Starring Jamie Dornan and Dakota Johnson, Fifty Shades Freed will also hold midnight screenings on Wednesday, Feb 7 at 12:01 AM in selected cinemas in Metro Manila and key regional cities. Tickets will be at regular admission prices. Please refer to the infographic below for participating cinemas. Fifty Shades Freed brings to a shocking conclusion events set in motion in 2015's Fifty Shades of Grey and 2017’s Fifty Shades Darker which cumulatively grossed almost $950 million globally. Believing they have left behind shadowy figures from their past, newlyweds Christian (Dornan) and Ana (Johnson) fully embrace an inextricable connection and shared life of luxury. But just as she steps into her role as Mrs. Grey and he relaxes into an unfamiliar stability, new threats could jeopardize their happy ending before it even begins. Fifty Shades Freed is directed by Fifty Shades Darker’s James Foley and once again produced by Michael De Luca, Dana Brunetti and Marcus Viscidi, alongside E L James, the creator of the culture-spanning blockbuster series. The screenplay is by Niall Leonard, based on the novel by James. For the author-producer, completion of the entire trilogy provided immeasurable amounts of satisfaction. In Philippine cinemas February 7, Fifty Shades Freed is distributed by United International Pictures through Columbia Pictures.